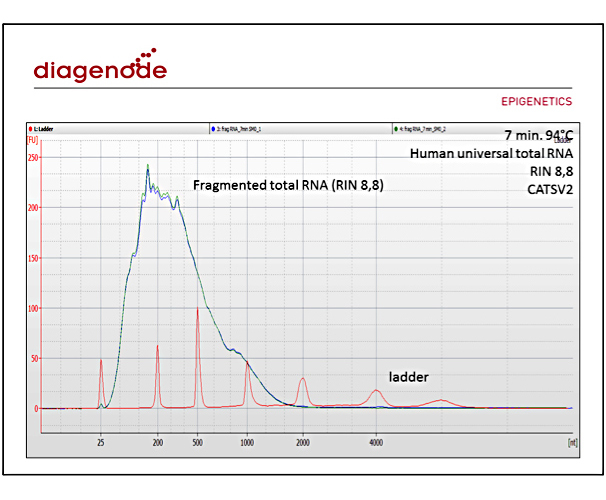 Diagenode technology utilizes the innovative “Capture and Amplification by Tailing and Switching” (CATS), a ligation-free method to produce DNA libraries for next generation sequencing from low input RNA. This solution is designed for an advanced researcher who has extensive experience with RNA sequencing. While simple and fast, CATS RNA-seq offers a number of advanced features for challenging samples for an expert user. The CATS protocol is much more efficient for RNA-seq library creation than protocols that use ligase by incorporating sequencing adaptors during cDNA synthesis in a single reaction tube. CATS thus allows for optimal sequencing of sensitive, degraded, rare, and low input RNA samples. The CATS RNA-seq kits for library preparation are ideal for studying extracellular cell-free RNA (cfRNA) that may potentially represent cancer biomarkers, and are detected as serum or plasma-derived RNA, FFPE-derived RNA, and exosomal RNAs. Additionally, CATS-based RNA sequencing is optimal for the study of non-coding RNA (ncRNA) that regulate gene expression at the transcriptional and post-transcriptional level including miRNA and long non-coding RNA ( lncRNA). Prior to RNA sequencing, the preparation of suitable libraries for the NGS platform is required . The library preparation typically requires the conversion of the template RNA into cDNA and the fusion of adapters to both ends before PCR amplification. For ligation-based techniques, the addition of the adapters by RNA ligase is heavily biased because of its uneven affinity towards the different template sequences. In addition, these techniques necessitate large amounts of RNA input. This white paper discusses the straightforward, cost-effective, highly efficient “Capture and Amplification by Tailing and Switching” (CATS) to easily generate ready-to-sequence NGS libraries from picogram quantities of RNA. I like the Diagenode CATS RNA-seq kit for a number of reasons…. Highly recommended for anyone who is struggling with generating a library from low input and challenging samples.. Which Illumina sequencing platform should I use when working with CATS RNA-seq libraries? Diagenode recommends whenever possible to sequence CATS RNA-seq libraries on 4-colour Illumina sequencing platforms (e.g. HiSeq 2500 and MiSeq). However, CATS RNA-seq is also compatible with other Illumina sequencing machines, although particular sequencing recommendations are advised as below. (*) Read2: Do NOT spike a “custom” CATS paired-end sequencing primer (for read2) (C17011050) into the standard Illumina primer (because the standard primer will lead to sequencing of polyA tracts, reducing run quality). PhiX is required and will be read from read1, but will not be read in read2. Which commands should I use when trimming reads prior to mapping of CATS RNA-seq data? Due to special construct of CATS libraries including template switching and artificial poly(A) tailing, particular trimming procedures are needed to clean the reads prior to mapping. This step is mandatory -- not completing or improperly completing this step may result in a low mapping rate of the reads. Here are the commands that should be used with the Cutadapt software to trim reads (SE, PE) prior to mapping. 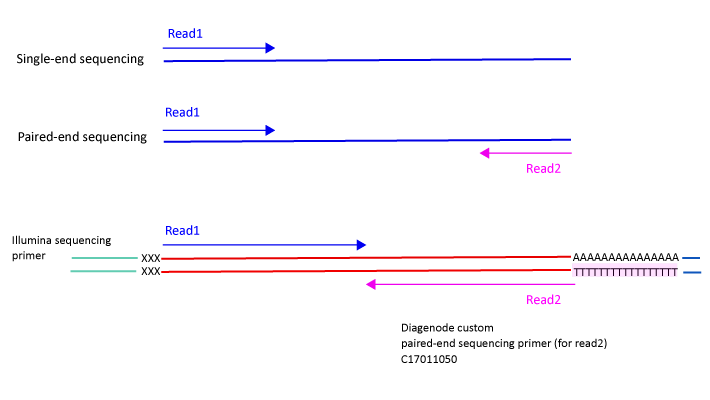 For paired-end reads both commands: Read1 and Read2 are needed. For single reads please use only the Read1 command. Note that an installation of Cutadapt is necessary. What is the shelf life of CATS RNA-seq kits? I would like to sequence pooled libraries prepared with the CATS RNA-seq kit and from some other kit vendors. How should I proceed with barcoding? 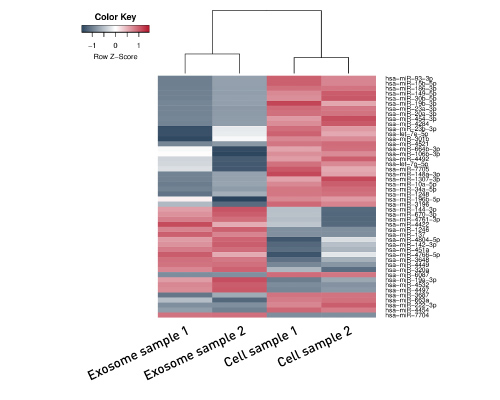 CATS RNA-seq kits include up to 24 indexes. CATS uses the TruSeq small RNA indexes. 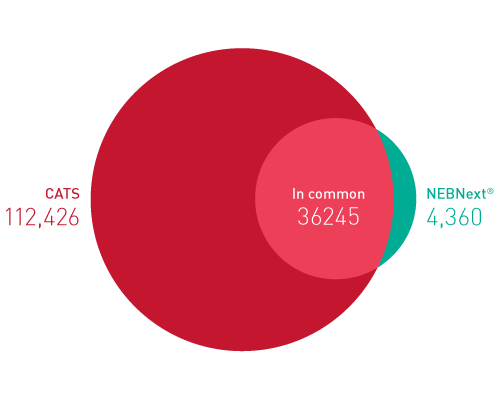 CATS libraries can be sequenced together with other Illumina compatible libraries as long as the indexes do not overlap. If using CATS paired-end sequencing primer for read2, will I also sequence a PhiX control in read2 mode? No. PhiX is meant to be sequenced with the standard Illumina sequencing primer. CATS paired-end sequencing primer for read2 will not read the PhiX control. I would like to study some specific RNA molecules that are between 80-300 nt. Which would be a solution for this? 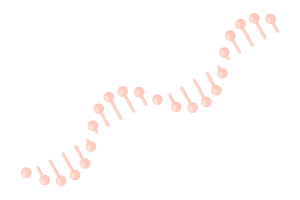 A size selection of the bulk RNA can be performed before starting the library preparation. This can be easily done with Agencourt AMPure RNAClean XP beads or QIAGEN miRNeasy Mini Kit. Does the CATS RNA-seq library preparation require working on ice? No. The library preparation can be carried on a bench at room temperature. However, reagents and RNA solution which are taken out of the freezer must be placed on ice if not used immediately (once thawed). In the same way, reagents and RNA solution that are no longer being used must be quickly stored back in the freezer. Please consult respective manuals for storage conditions. 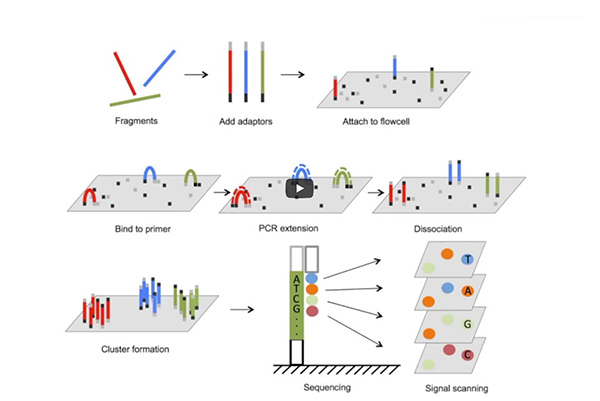 Is there any contamination with adapter dimers in CATS RNA-seq libraries? There is no adapter dimer contamination in CATS RNA-seq libraries, since the technology does not use any ligase. There is no step of ligation, thus adapters cannot be ligated to each other. Additionally there is no “empty library” in the CATS RNA-seq technology. I end up with low % of mapped reads after mapping to the reference genome with CATS RNA-seq library prep. What would you advise? 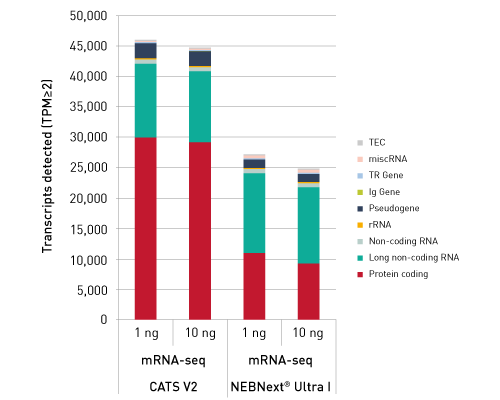 Have we tested CATS small RNA-seq on plasma or serum samples? Yes. CATS technology works on RNA extracted from serum and plasma samples. It works very well for circulating RNAs. Does CATS RNA-seq kit work with standard Illumina sequencing primers? Yes. For single-end sequencing we recommend using the regular Illumina sequencing primer (read 1). For paired-end sequencing the “CATS paired-end sequencing primer (for read2)” is required. What is the standard RNA fragments length that can be used in CATS RNA-seq kits? For CATS total RNA-seq (with rRNA depletion) Kit, CATS mRNA-seq (with polyA selection) Kit and CATS RNA-seq Kits, we are chemically fragmenting RNA to achieve a mean size between 200-500nt. Please see the image below. 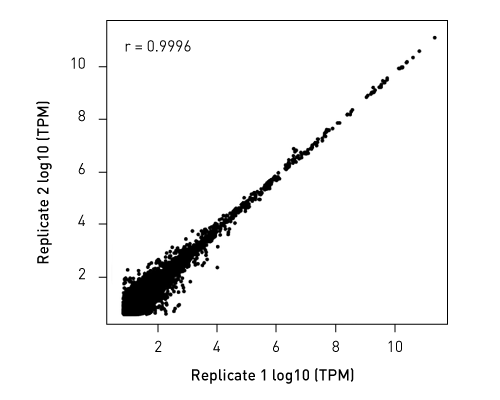 Regarding the CATS small RNA-seq Kit, you recommend two options: either starting with total RNA (intact) or the small RNA fraction (< 200nt). What is the species compatibility of the CATS RNA-seq kits? *Not for bacteria and we haven't planned to work on validating other species right now.